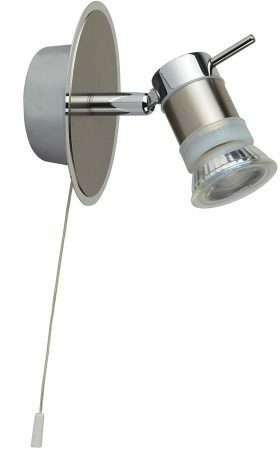 The Aries chrome switched bathroom wall spotlight, a compact IP44 rated bathroom wall spotlight. Mirror chrome finish with satin silver detail, complete with pull cord switch and LED GU10 spot lamp. This wall spotlight is fully splashproof and suitable for bathroom zones 1 and 2. Perfect for lighting your bathroom, kitchen or any other room in your home. The polished and satin chrome creates a clean, simple look for any wall and the angle of the head can be adjusted to create the lighting effect of your choice. Please see our main category of bathroom wall lighting for a wide choice of bathroom IP rated wall lights, including both traditional and contemporary styled wall lamps.